A windy start to the weekend will bring localised gales across the East Midlands, the Met Office has forecast. The morning will start with sunny spells before high winds bring cloud and rain across the region, leading to rain in the wake of Storm Erik. Temperatures will be higher than seen in previous weeks at a maximum of 10 degrees. The forecast for Saturday and Sunday said: “Very windy for northern areas with gales, these locally severe, and blustery showers this morning. “Then becoming mostly dry with sunny spells this afternoon, with the wind easing later. “Windy for southern areas, with isolated morning showers, and sunny spells. Maximum temperature 10 degrees. “Overnight it will be mostly dry with temperatures quickly falling, as the wind continues to ease to become light, before cloud increases and outbreaks of rain and later hill snow spread northwards overnight. Minimum temperature two degrees. 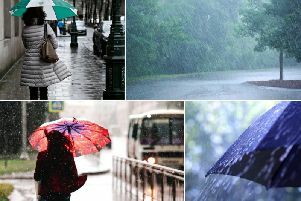 “Sunday will see outbreaks of rain with local sleet and snow mainly but not exclusively over high ground, clearing southeastwards through the afternoon.